Blog to End the Occupation: Tell TIAA-CREF: Divest from the Israeli Occupation! 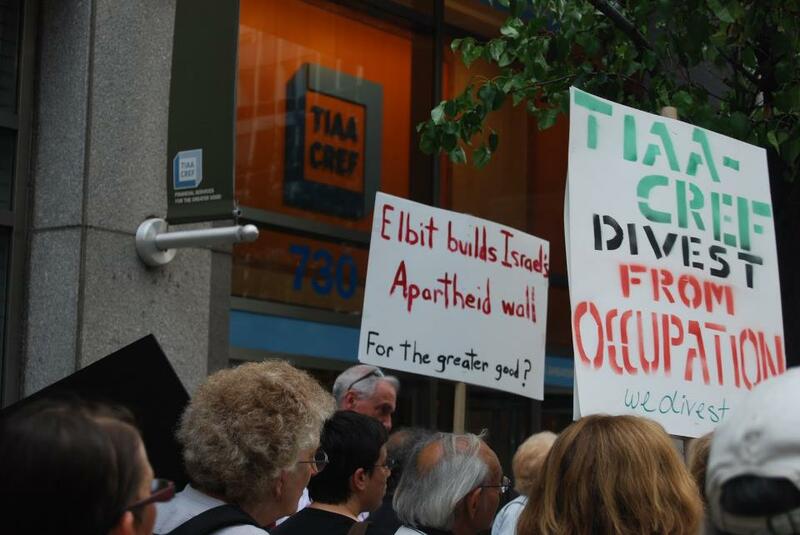 Tell TIAA-CREF: Divest from the Israeli Occupation! On Tuesday, July 17 several of our member groups are planning actions around TIAA-CREF's shareholders' meeting to demand that TIAA-CREF live up to its motto "For the Greater Good" and divest from all its holdings in companies profiting from the violation of international law and Palestinian human rights. Adalah-NY is planning a street action with songs, music, dancing, and chants from 12:30-2:30pm at TIAA-CREF headquarters in New York (730 3rd Ave, between 45th and 46th Sts). Find more information and RSVP on Facebook. In Chicago several groups, including American Friends Service Committee, Jewish Voice for Peace, and Committee for a Just Peace in Israel and Palestine, are holding a rally and protest. Rally will begin at 12:00pm with speeches by Electronic Intifada founder Ali Abunimah, community leaders, and shareholders at the Thompson Center (100 W. Randolph Street). There will then be a protest at 12:45pm in front of the TIAA-CREF office (200 N. LaSalle St.). Find more information and RSVP on Facebook.